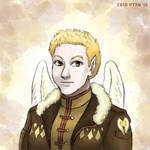 Formal-wear portrait of one of the Embassy's resident kids, from Leif & Thorn. Iona Nibelungsen: tween twin daughter of the Culture Minister, picking up the Ceannic language a little better than her sister. Gets around on a floating chair (her legs move, they're just too small to walk on). Oddly immune to the memory-clouding abilities of...uh...what's-her-face.